We recently purchased a second copy of LiveCycle so that I can aid in form development. I had a 60-day trial installed awhile ago (that has since been uninstalled) and everything worked fine. I could edit PDFs and then preview them right inside LiveCycle. So a few months since the trial go by and now we decide to actually purchase it. I get it installed and open up a form to get to work - then I notice the PDF Preview tab is gone and in the "View" menu, it is grayed out. F5 also does not work. Make sure Display PDF in Browser is checked. I don't have this option in Arobat Pro XI, but I installed Reader X and it was there and checked. Installed Acrobat before LiveCycle. Tried it, didn't work. Make sure the Adobe PDF Viewer is enabled in Internet Explorer. Done, was enabled when I checked. Reinstall all products. Uninstalled Acrobat XI, LiveCycle, and Reader. Reinstalled Acrobat XI, then LiveCycle. No luck. 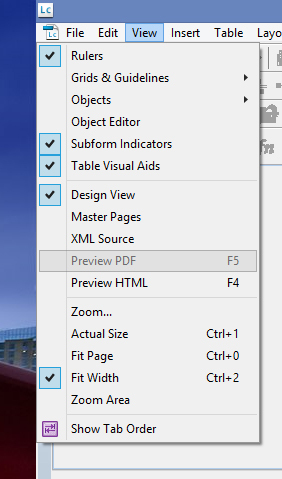 Set Acrobat XI as the default PDF viewer. Already done, did nothing. We're at our wits end trying to figure this out. Any help with this would be greatly appreciated. Also, as I mentioned earlier, this worked before during the 60-day trial period with the same exact software. I really have no clue why it's not working now.